Founded in 2004 by former organic grocer Cynthia Beal, the Natural Burial Company began as a question: what would happen if we all buried ourselves naturally, and put our bodies back where we got them - from the soil, from the Earth itself? What would happen if we just "put our stuff back"? The answer quickly became obvious: what would happen was something much, much better than what we're doing now. Sensing a mood not unlike the revolution in organic farming and natural foods that she'd been involved in since the 80's, Beal figured offering people biodegradable coffins and natural burial goods would be an exciting way to participate in the changing of another guard - the funeral industry. In 2005 she began working with Hazel Selena and Peter Rock of ARKA Ecopod, determined to bring the recycled paper Ecopod coffin to the USA to open minds and markets. 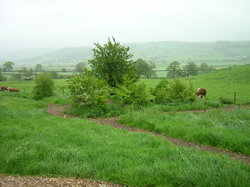 It took her until 2006 to track down the high-quality woven coffins and urns she wanted to offer the Ultimate Composters of tomorrow and in 2007, Beal made her first extensive tour of some of England's most popular natural burial grounds. The end of that year saw the first container of handmade woven coffins come across the water from the UK, and the first biodegradable coffin gallery was born in Portland, Oregon. 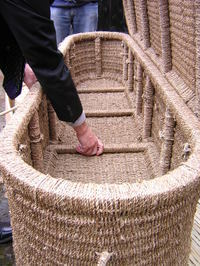 The tried and tested woven coffin lines in the Natural Burial Company's line are made by responsible companies who've sold thousands in the UK, and want to supply environmentally friendly options in North America, too. 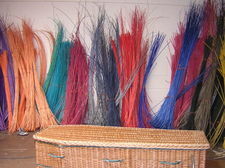 Woven coffins are lightweight and easy to handle, naturally durable and don't use styrofoam or plastic packaging when they're shipped. They biodegrade more rapidly than wood, forests aren't cut down when woven fiber is used, and the skilled artisans who make them keep the weaving and paper handicraft arts alive. 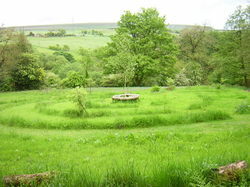 Natural burial is not only beautiful (thanks to the diverse habitat and beautiful landscapes it creates) - it's practical, too. And - in our experience and contrary to popular belief - the USA is filled with practical people. Actually, most people around the world are practical, really, when you get right down to it - and when they're clear on the choices and the consequences of their actions, most people want to do the right thing. It's only a matter of time, and of making sure sustainable options are available when people are ready to implement them. We can't bury plastic and stamped steel and chipboard and embalming fluid forever. The resources are expensive, and the potential for eventually contaminating precious aquifers is too great. The tide will turn, and natural burial will become one of the answers for a growing number of environmentally concerned people. As the paradigm shift around a natural end of life happens, a variety of opportunities will open up for both service and livelihood. 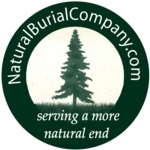 The Natural Burial Company is working to help that happen. As soon as enough people say they want a "natural burial" forward thinking funeral directors and cemeteries will begin to transition to better practices, and the NBC wants to see them get there. New types of services - like celebrants and home funeral guides - are now coming into being. We want to see artisan casket makers, urn creators, weavers, shroudmakers, and a whole host of other crafters able to participate in an opportunity to turn a market around. As funeral directors and cemeteries interpret the call to "green" in their own particular way, we're confident citizens will find the spot that's just right for them. THE NATURAL STEP - HOW TO KNOW IF IT'S "GREEN"
The products we select to sell are made to a variety of standards and guidelines that are influenced by a number of factors. We're not advocates of certification in the natural burial movement yet - there are too many different ways to offer natural options, and it would be a mistake to pick one narrow path and force everyone else to adapt to it. The amazing variety of choice in the UK is proof enough that we should stay open minded and support diversity as long as we possibly can. There's a lot of talk about what is and isn't "green" these days. The Natural Step Framework provides a guide for folks that want to improve their practices in both producing and consuming goods. Its four principles create a useful overall approach to "what is natural" - they're grounded in simple science that any business or individual can use to evaluate a product or service's sustainability in the larger scheme of things. Labor - your production conditions should at least meet or exceed fair labor standards; we won't knowingly purchase coffins made with prison labor, for example. Learning Curve - Education is needed! In 2009, Beal spoke at the Oregon Society of Soil Scientists' annual conference. Instructors and students alike were taken with the idea of natural burial and the possibilities it holds out for positive changes in current interment practice. With over 45,000 active cemeteries in the US and perhaps a couple hundred thousand more in varying states of maintenance (or not), the lack of a University-level program that brought hard science to the issues of cemetery impacts on the environment and sustainable landscape management to the grounds itself became a missing piece that Oregon State University decided to fill. Beal is currently working with the University's Soils Department in the College of Agriculture to facilitate the creation of an online educational program that helps cemetery managers creatively tackle the challenges ahead, and points soil researchers to questions that need good answers. IF YOU MANAGE AN EXISTING MUNICIPAL OR NON-PROFIT CEMETERY, PLEASE MAKE THE TRANSITION NOW! Local Agenda 21, several decades old now, still offers concrete steps that cities and governments can take to shift their program practices, and hundreds of groups and organizations around the world are currently suggesting ways that we can make improvements.